Mass-directed fractionation is a method based on information obtained from the mass spectrometer. The high separation of Nexera UHPLC coupled with ultra-fast LCMS-2020 enables high speed purification based on UV detector as well as mass triggers. 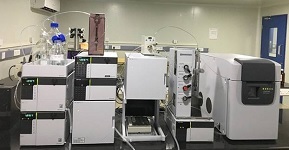 The separation system combines the power of slope and threshold from the UV chromatogram along with the target ions (m/z) in the mass chromatograms, to achieve fractionation with a high degree of confidence. The high selectivity of LCMS-2020 enables highly efficient recovery of target compounds from samples containing a large number of contaminants and making it easy to scale up from analytical to preparative. Fractions collected can be quickly checked for purities by applying the Ultra fast fast LC analysis . The LCMS-2020 based mass directed purification is an ideal choice for preparative isolation of natural products from complex mixtures, isolation of impurities from pharmaceutical active materials etc.